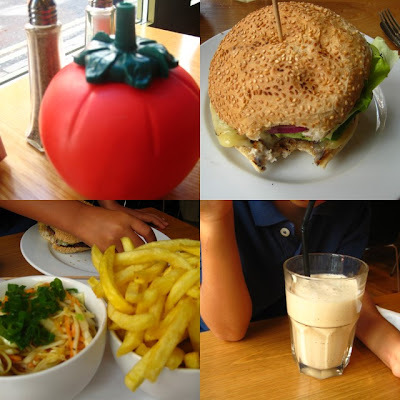 After a morning at Hamleys and the craziness of Regent street, we went to a hamburger restaurant in nearby Covent Garden for lunch. Gourmet Burger Kitchen (a.k.a. GBK), started about five years ago with New Zealander chef Peter Gordon as the consultant on the menu. The concept is simple – a modern cafe-style atmosphere where there is minimal table service (you order and pay for your burgers at the counter before sitting down and waiting to be served) with freshly-prepared burgers cooked to order. The sourdough buns are baked daily, only Aberdeen Angus Scotch beef is used for the hamburgers while fresh English chicken are used for chicken burgers. There are also a few distinct burger options – lamb, chorizo and buffalo for the adventurous and vegetarian ones like lentil, Portobello mushrooms and aubergine along with special sauces (Garlic Mayo, Blue Cheese, Satay, Chili, Barbecue, Sour Cream or Smoked Chili Mayo) along with assorted sides (crispy coleslaw, thick or thin fries, salads, olives and broad beans). There are also milkshakes, wines and beers on the drinks list. We opted for their traditional hamburgers – a classic (beef, salad, mayonnaise and relish) for A, a classic with cheddar cheese for me and a junior beef with cheese for J. We decided to share two sides – the coleslaw and thin fries plus a chocolate milkshake for J. The place started to fill up with the lunch crowd ordering takeaway burgers as there were no more tables available. The food took awhile to get to us (about twenty minutes) but when it did, it was worth the wait. The burgers were large chunks of meat – seared on the outside and juicy inside and served with a generous slice of tomato, salad leaves, pickles and mayonnaise. We asked for some extra mustard and mayonnaise on the side. On every table was a really cute plastic tomato bottle of ketchup. The coleslaw was indeed crunchy and had a tangy vinegar dressing while the thin fries were crispy and hot. The milkshake came in a large metal glass that kept it cold and was thick and chocolatey. The delicious meal cost us £20 (around €25 or US$39) – a bargain in overpriced London. 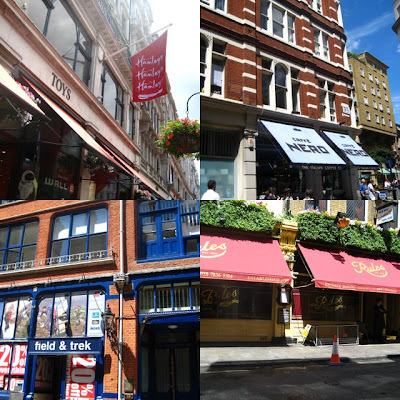 After that, we took a short walk around the area through Covent Garden before heading back to the hotel for a rest and a challenge game of Monopoly – the loser being the one who would treat for dinner. More on that later.